The port city of Genova is home to Serie A’s oldest and youngest clubs. Genoa Cricket and Football Club were founded in 1893; in contrast it wasn’t until August 1946 that two existing teams, Andrea Doria and Sampierdarenese, merged to form Sampdoria. The club spent its early years in the top flight without ever challenging for lo scudetto, and by the time oil trader and entrepreneur Paolo Mantovani took over the presidency in 1979 Samp had fallen to mid-table in Serie B. But in a few short seasons under Mantovani, Sampdoria were transformed into one of the top sides in Italy, and then Europe. Perhaps the first key development in the Mantovani era was the purchase of two of Italy’s most talented forwards, Roberto Mancini and Gianluca Vialli, who arrived from Bologna and Cremonese respectively to form a formidable long-term partnership at Sampdoria. Prolific goalscorers for the club, the “gemelli del gol” or “goal twins” each scored in the second leg of the 1985 Coppa Italia final against Milan to secure Samp its first ever trophy. They were victorious in the competition twice more in the eighties, and by the end of the decade had become a force in Europe, losing the final of the Cup Winner’s Cup to Barcelona in 1989, before winning the same trophy the following year against Anderlecht. Yet still lo scudetto eluded Sampdoria — indeed their best result in Serie A had been a fourth place finish back in 1960-61. But they had every right to dream big. Traditional title challengers Juventus were enduring a slump in their domestic dominance, and while northern giants Milan and Inter were building highly competitive sides, in recent seasons both Verona and Napoli had become first-time league winners. 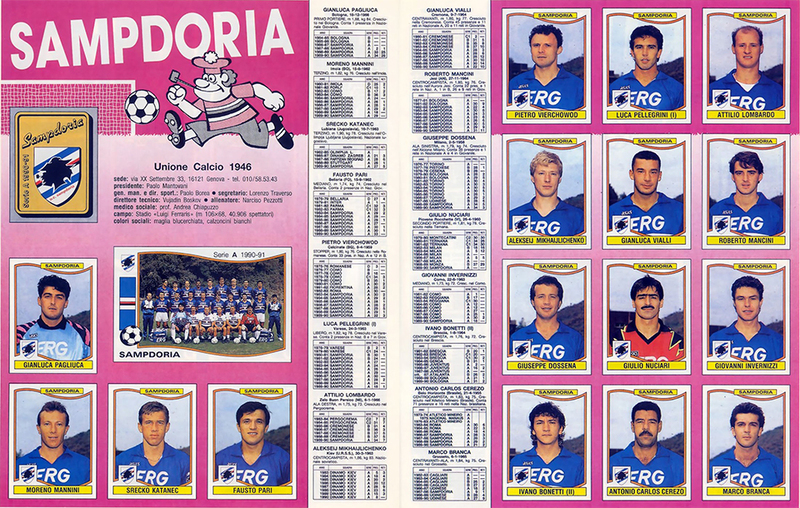 Coached by the wily Serbian Vujadin Boskov, the 1990-91 Sampdoria squad was a healthy blend of domestic and foreign talent, enthusiasm and experience. Goalkeeper Gianluca Pagliuca provided a steady and spectacular presence behind rock-solid defenders Pietro Vierchowod and Moreno Mannini. In midfield Srecko Katanec and Alexei Mikhailichenko partnered with veteran Brazilian Toninho Cerezo, a survivor of the ’82 World Cup, while the glistening pate of prematurely balding winger Attilio Lombardo became a familiar sight along the flank. In the second half of the season the Sampdoria failed to lose a single match, beating their direct rivals Juventus, Milan and Inter before finally clinching the title with a home win against already-relegated Lecce. It was a popular victory for the neutral in Italy, though some claimed Samp’s triumph was assisted by Juventus’ woeful season and Napoli’s self-combustion following the suspension of Diego Maradona. Coincidentally, Sampdoria’s city rivals Genoa enjoyed their best season in Serie A for almost fifty years, finishing fourth in the table. The following year Boskov’s champions failed to repeat their scudetto success, finishing a disappointing sixth. 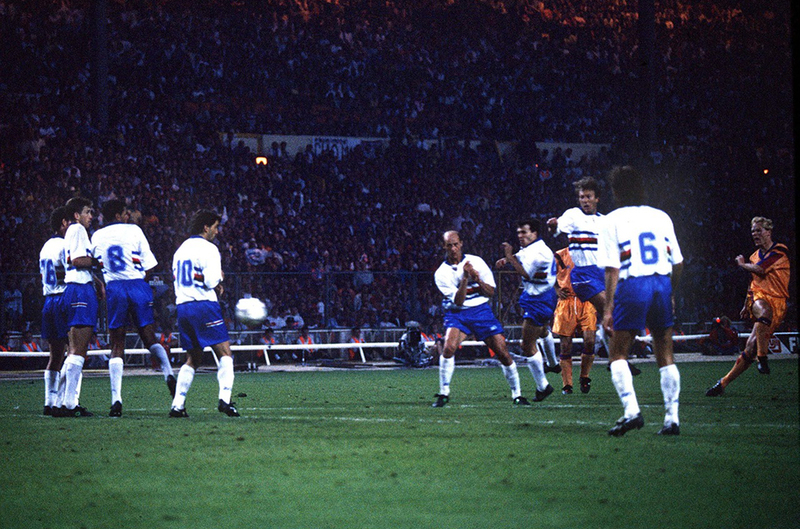 Perhaps their attention was focused on their European Cup campaign, a thrilling odyssey that took them all the way to a final against Johan Cruyff’s Barcelona at Wembley in May 1992. As was typical of the era, a tight but absorbing affair offered scant goalmouth opportunities. 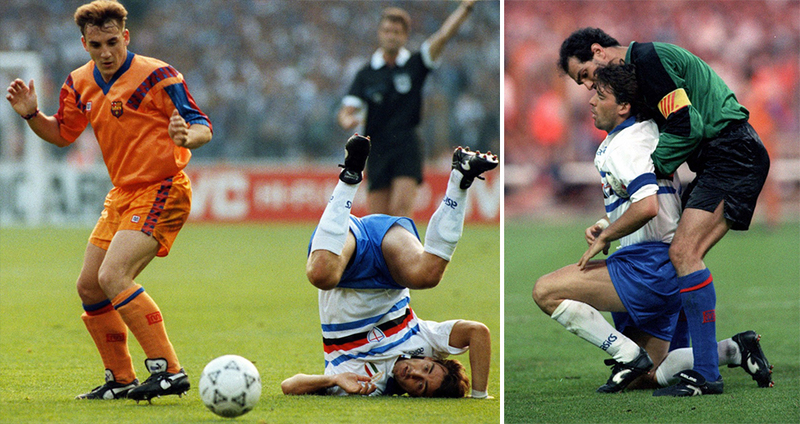 Nevertheless Hristo Stoichkov hit a post for the Catalans while Vialli, in his last match for the club, was unlucky not to score at least once in the second half. The contest was settled deep into extra-time by an unstoppable free-kick off the right foot of Dutch defender Ronald Koeman. Sampdoria had lost the biggest match in its history, but it was a victory that Barcelona had coveted for much longer. 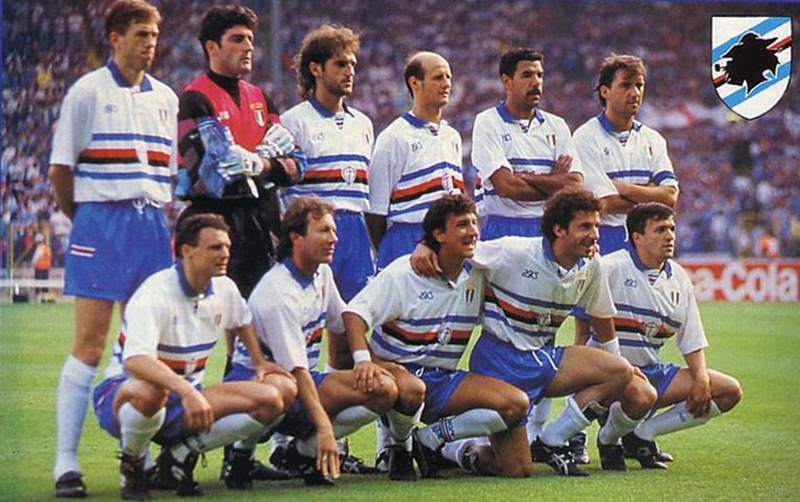 Sampdoria wore white shirts that night at Wembley, identical to the one in these pictures but for the scudetto shield, missing sponsor and commemorative embroidery (not available on commercial models). The shirt was essentially a preview of their 1992-93 away strip. By now the ERG sponsor had become something of a trademark for the club, almost as much as their horizontal stripes (from which derives the nickname blucerchiati) and symbol of a pipe-wielding sailor, known locally as Baciccia. I bought this shirt in the summer of ’92 from a tiny shop in my friend’s town. The friend in question already had the long-sleeved home version of the previous season’s scudetto-winning shirt. I haven’t seen him in almost twenty years and I sometimes wonder if he still has it. Later that summer Vialli was sold to Juventus for four billion lire. With the extra cash Mantovani brought in gifted youngsters Vladimir Jugovic and Enrico Chiesa, plus England defender Des Walker. Sampdoria already had a successful track record when it came to British imports, with Trevor Francis, Graeme Souness and Liam Brady all enjoying happy spells at the club in the mid-eighties. But Walker, frequently forced to play out of position by new coach Sven Goran-Eriksson, endured only a single wretched season in Genoa, in which the team finished seventh in Serie A. The following October president Mantovani died suddenly, leaving his son Enrico to handle the running of the club. 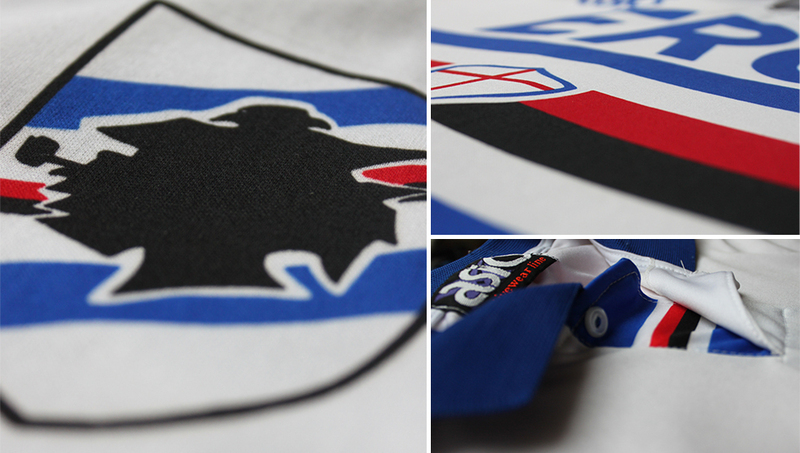 While the Mantovani era wasn’t technically quite over, Sampdoria’s best days seemed to be behind them. 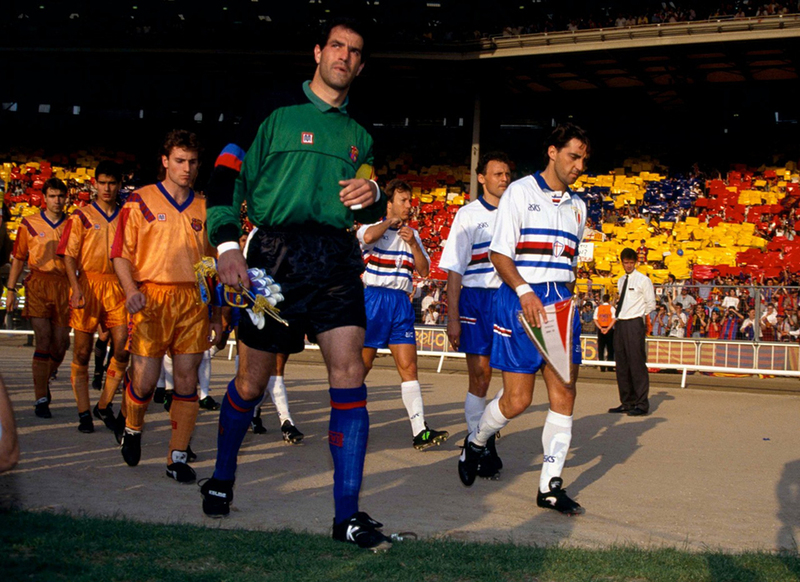 The club did its best to pull its weight in Serie A through the remainder of the nineties, but despite winning another Coppa Italia in 1994, never really challenged for the top prizes. England captain David Platt arrived from Juventus, faring much better than his international teammate Walker had in Genoa, becoming something of a local hero. But Vierchowod, Jugovic and Lombardo eventually all followed Vialli in the opposite direction to Turin. In the period that followed Sampdoria seemed to be solely a port of call for players on their way up (Chiesa, Mihajlovic, Karembeu, Seedorf, Veron, Montella) or on their way down (Gullit, Zenga, Ferri, Evani, Klinsmann, Signori). Mancini clung on to the captaincy until 1997, when he left Genoa after fifteen years, finding scudetto success again in 2000 with Lazio as a player, and later as coach of Inter and Manchester City. 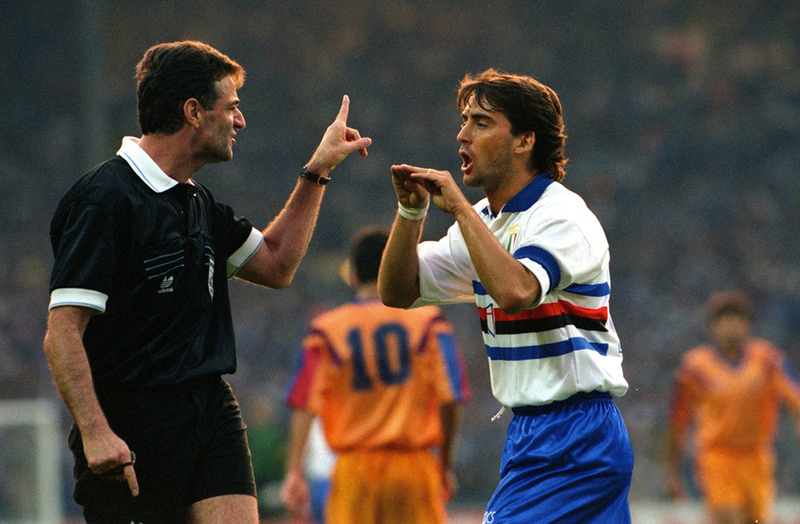 Following Mancini’s departure Sampdoria were relegated in 1999 and spent the next four seasons in Serie B. They returned to the top flight in 2003 and after heroically reaching the preliminary stages of the Champions League in 2010, slipped back into the second tier the following season. This time Samp bounced back immediately, but so far their current season has been nothing if not turbulent. 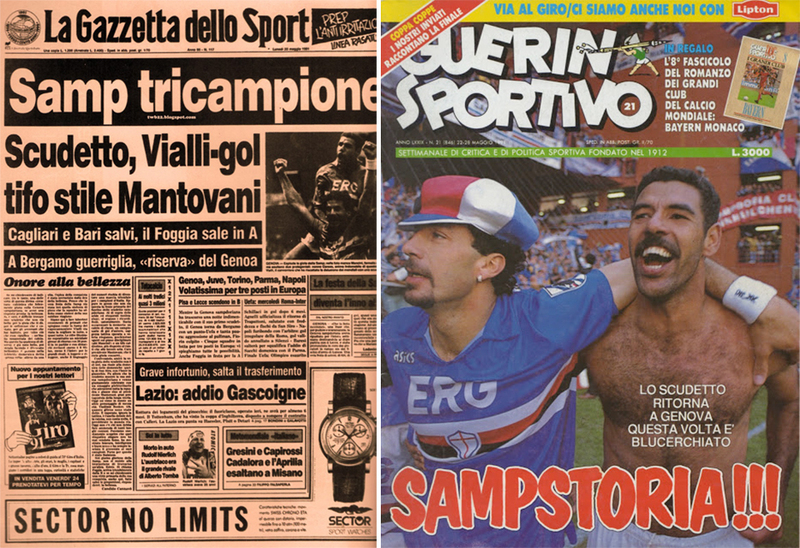 Incredibly, Sampdoria’s fortunes can be tied to its famous ERG sponsor. Just as the club’s finest successes had arrived following the introduction of the petrol giant’s logo to its shirts, so its form tanked after the acronym sponsor was replaced in the mid-nineties. When Riccardo Garrone took over the club presidency in 2003, just as Sampdoria were returning from a spell in the wilderness, so the club became reacquainted with the company Garrone’s father had founded as Edoardo Raffinerie Garrone back in 1938. In January 2013 the popular Garrone died after a long illness, effectively terminating Sampdoria’s long-standing connection with the company and also briefly illustrious past.